Once you start serious construction work, those 16-gauge extension cords somehow start to multiply. The best way we’ve found of keeping them tidy is by spooling them up into the bottom a 5 gallon bucket. A designated “cord” bucket means you’ll not have to search all over for a cord, assuming you remember to always put them away. And this cord spooling idea can be easily combined with a bucket tool apron. If you don’t mind making this a “leaky” bucket, you can punch a hole in the lower part of the bucket wall for the plug. This setup is best if you store your cords near your external outlet. 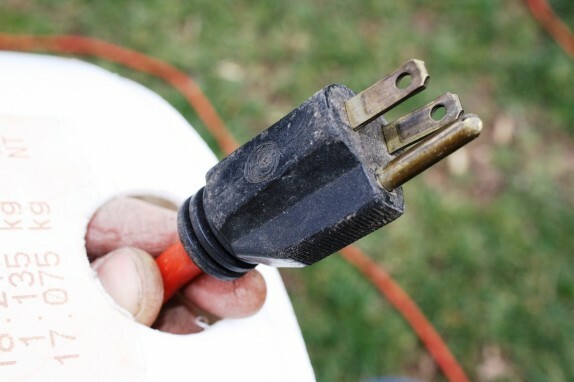 Normally you’d want to keep the lid around to keep the water off, but an additional drainage hole right at the bottom will act as double insurance in keeping those cords dry. It’s the same trick you can use for outdoor garbage cans to prevent the water collecting. 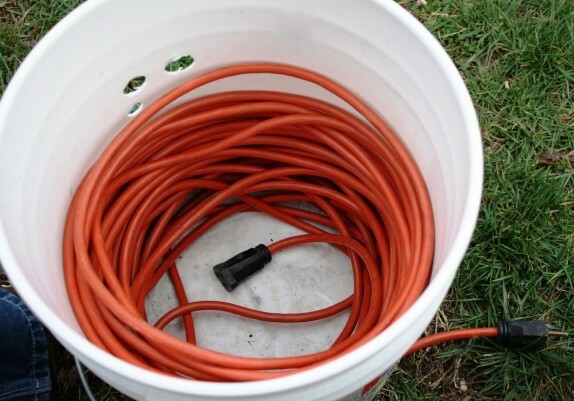 Just don’t use the cord while it’s still wound up inside the bucket, the heat build up can cause a fire.